The shamanic journey is not ritual alone, but is all of life. All of life’s moments have power. Every breath opens wondrous possibilities. Like beads being strung to create a necklace, one bead after another, everything that happens is leading to a larger whole. You never know where the shamanic journey will lead because every moment opens wondrous possibilities. Each step has a lesson, transformation, elation, or other magic power. The more you grab the moments, the more is available to you: bigger lessons, more profound transformations, greater joy, deeper self-fulfillment, further movement toward cherished goals. It can be hard to remember each and every step of any journey, whether financial, familial, creative, or otherwise, has value, as opposed to being irrelevant, trivial, or unnecessarily delaying. Times of not directly hitting goals—e.g., hesitations, wanderings, or delays caused by external factors—are part of the journey toward my goals, not distractions from that journey. But I easily forget that; delays and the like become frustrating, if not downright demoralizing. Reviewing the process that led to the necklaces I started creating last year makes it easier for me to remember that each life experience was a steppingstone toward my ultimate goals. Her strategy worked. I signed up for a silversmithing class. Little did I know that would kickstart a lifelong interest in jewelry-making. I went on to take a few metal-smithing classes in college. I remember constructing a sterling silver scorpion (I am a Scorpio). Submerged in the morbid angst typical of many college-age kids, I fashioned a hangman’s noose, in sterling silver, to wear as an earring. Even then, I tended toward jewelry pieces that I found meaningful. My silversmithing never evolved past three classes. That’s fine because any creative endeavor feeds one’s creativity. I’m rather proud of that abalone necklace, considering that micro macramé was nonexistent then, but I decided to try tiny macramé, though I’d never heard of it. That was my only macramé necklace. Nevertheless, last year, which was decades later, looking at the piece assured me that a recent vision I’d had of sacred necklaces was not amiss. 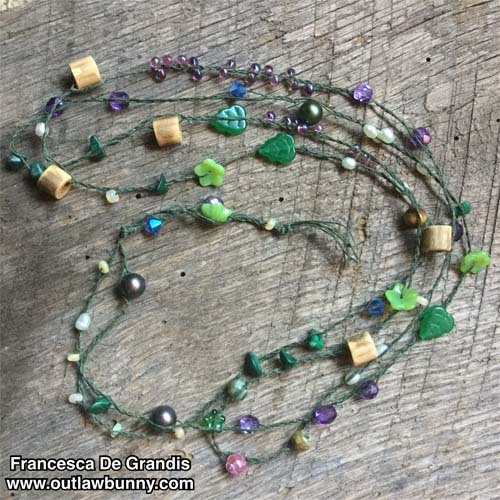 For one thing, I wove plain old embroidery thread for the abalone necklace. 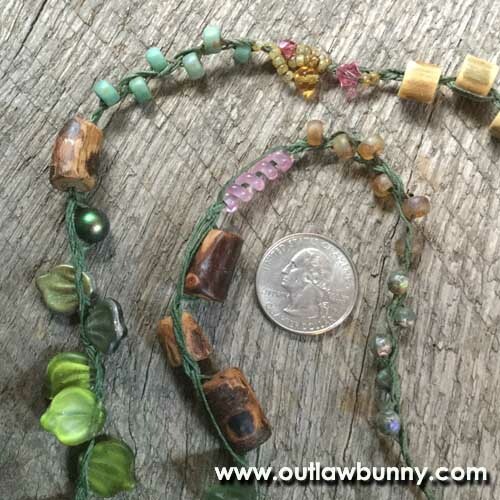 That reassured me, last year, when I started experimenting with weaving waxed linen cord and beads to make magical necklaces; I figured if I’d done what I had done with mere embroidery thread, I was more likely to be able to do something even prettier and more durable with the gorgeous waxed linen. 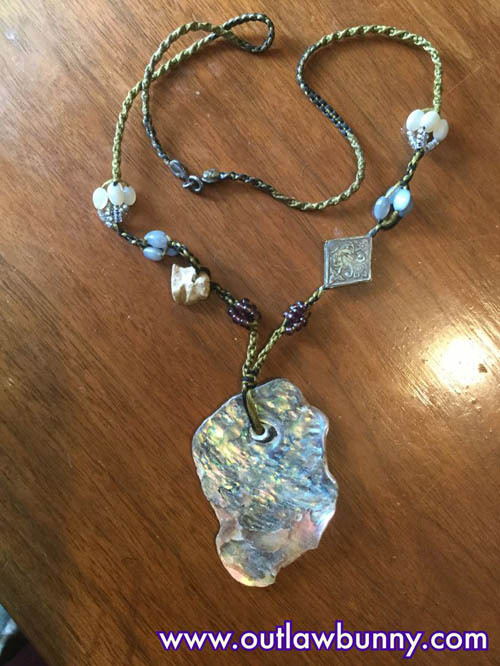 For another, what I did with seed beads back then became a template for what I’m doing now: it’s hard to see in the photo of the abalone necklace, but there are seed beads clusters—silver clusters and dark amethyst color clusters. I had no idea weaving a necklace so fastidiously, decades back, would help me in 2018. Every breath opens wondrous possibilities. Though I loved my beadweavings, was blessed with the opportunity to show them in a gallery, and lovely people purchased them, I never enjoyed making them. And constructing them required physical movements that hurt my back and arms. However, those endeavors, too, were steps along my route. My technical ability and aesthetic grew from weaving seed beads, informing the weaving I do now to make magic necklaces of waxed linen cord, larger beads, and seed beads. 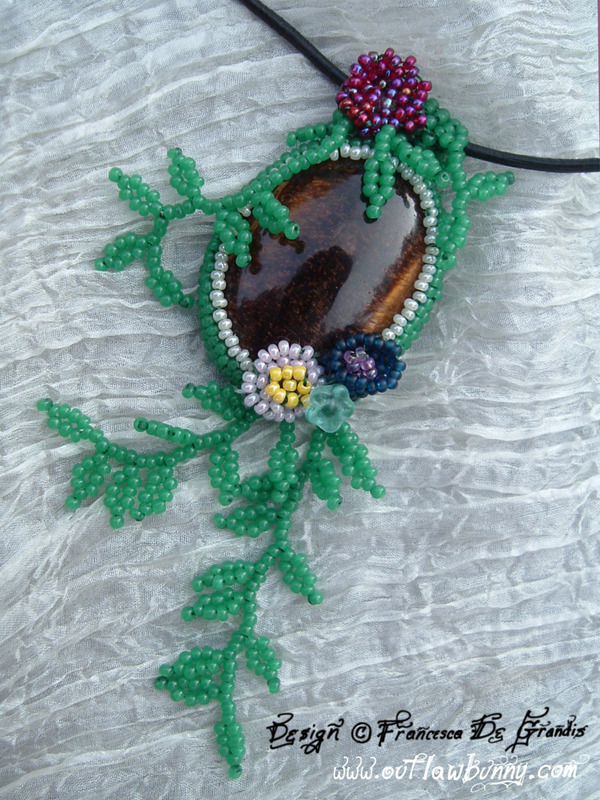 The old days of seed beading also provided an eye-opener, allowing my motives for forsaking physical well-being to surface from my subconscious, so I could heal them. I now take better care of my body, not pushing it ridiculously hard; tolerating physical pain for the sake of art or anything else is no longer my default! 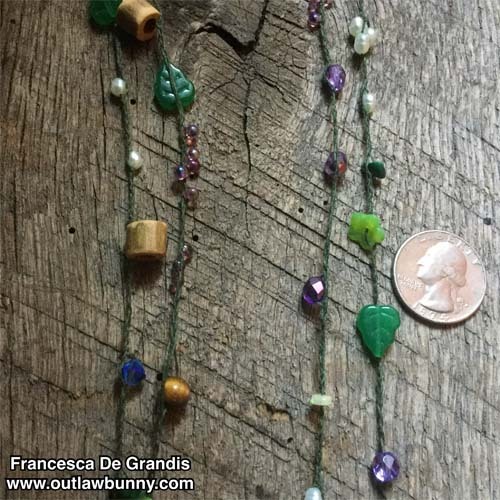 I never thought weaving seed beads would lead to the necklaces I make now—jewelry I have great fun making and that does not stress my body to make. I never suspected the physical pain of bead-weaving small beads would lead to a healthier life. Tedious high school curriculums eventually led to woodworking as a shamanic process, decades later, in my sixties. I make wooden talismans for myself and others to wear and to put in our homes or on our altars. Woodworking gives me more pleasure than silversmithing ever did. When I’m sanding, sawing, or doing pyrography, the wood sings to me, and I to the wood. We sing in harmony, creating wholeness, wholeness for me, for the wood’s spirit, for my Goddess, and for the cosmos. Since last year, I sometimes combine woodworking with the non-injurious, waxed linen beadweaving. Doing so is a spiritual experience that is joyful, fulfilling, empowering, and creative. I’m blessed to have had the many experiences that led up to it. I want to honor all of them as steps along my shamanic path. 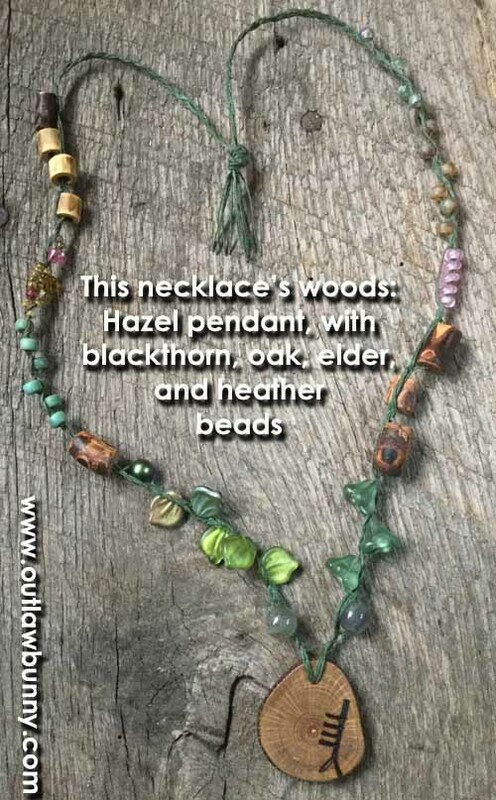 The two photos at the top of this post show one of my necklaces made of waxed linen cord, and some of its beads are wooden ones I made. Below is another of my waxed linen weavings in which there are pieces of my woodworking: a wooden pendant and wooden beads. Affirmation: The shamanic journey is not ritual alone, but is all of life. All journeys are shamanic, leading toward my heartfelt goals. I look forward to wherever I go from here. I affirm each moment along the way; each step has power and walks me toward my cherished goals; every breath opens wondrous possibilities. Dear reader, my one-of-a-kind handcrafted talismans are available exclusively to my newsletter subscribers. 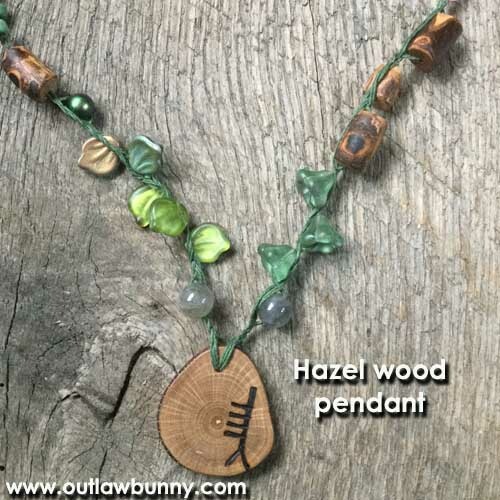 If you don’t subscribe to the newsletter yet, click here for a free subscription: https://www.outlawbunny.com/newsletter/. This entry was posted in Art, Writing, and Music, Spirit, The Whole Thing and tagged affirmation, altars, beads, beadweaving, classes, cord, creative, creativity, De Grandis, DeGrandis, earring, empowering, Francesca, Francesca De Grandis, freeform, goals, goddess, Handcrafted, jewelry, journey, Lessons, linen, Macrame, magic, micro macramé, mystical, necklaces, path, pendant, power, pyrography, ritual, Sacred, sanding, sawing, seed, shamanic, shamanism, Silver, silversmithing, spiritual, sterling, talismanic, talismans, waxed, weaving, weavings, wood, wooden, woodworking. Bookmark the permalink.